Do you ever get frustrated navigating through the accounting system with your mouse? Do you despise having to remove your hand from the keyboard to move your cursor while setting up contracts? Do you call PROCAS Support and wonder how they sometimes navigate the accounting system without moving the cursor? If you answered “yes” to any of the above, then this is the post for you! ** Note ** You can use the arrow keys to navigate the menus instead of letters if you would prefer. Hotkeys can also be used within a window to make data entry easier. There is a list of hotkeys on page 25 of the PROCAS Accounting User’s Manual version 3.01, but I am going to go through some of my favorite hotkeys and context for why you might like them. I will use the Billing Setup screen as an example, but these hotkeys can be used elsewhere as well. Honestly, if you are only going to use one hotkey in the accounting system, this is the one to use. If you are searching for a specific billing setup or transaction in the system, you can use this to find what you are looking for faster than sifting through records one by one. What is great about this is that you do not need to know the exact transaction you are looking for. When searching for a value, you can use “..” as a wildcard if you only know part of what you are looking for. For example, if you are looking for a task under project 10005, but you cannot remember which one it is exactly, you can hit “F5” and type “10005..” into the search box. This will take you to the first record that starts with 10005. This can be used at the other end for finding transactions without typing the full transaction number. For example if you are pulling up L101985, you can hit “F5” and search for “..1985” saving you from typing any letters. 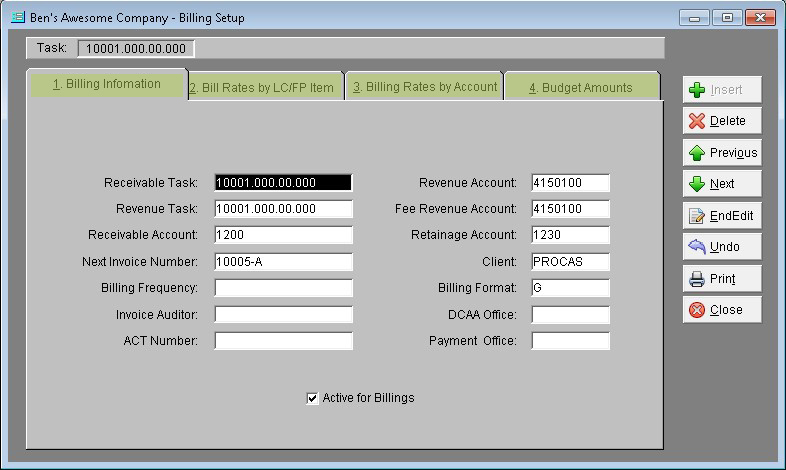 When entering information into Billing Setup, or any screen with multiple tabs, it can feel a little tedious to take your hand off the keyboard and click on the next tab. This key combination takes you to the tab number that you type. This means when you finish filling out tab one of Billing Setup, you can hit “Alt” + “2” and you will be taken to tab two of Billing Setup. This key combination is especially useful in Billing Setup because you can move back to tab one easily and then use “Page Up” or “Page Down” to move to another task. This is nice if you are modifying the billing setup for multiple tasks at once, or if you simply want to look at the setup on another task quickly. This key combination copies the previous record into the current box. If you are a fan of Excel then this is not a new shortcut for you. This can save you a lot of time when making entries with multiple lines that have similar information. 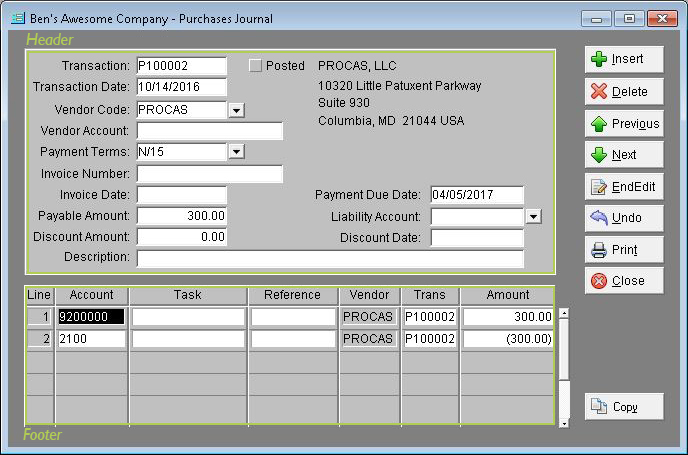 You are most likely to find this useful when making a payroll entry so that you can copy the account from the previous line or maybe when entering purchase journals to copy the vendor code. 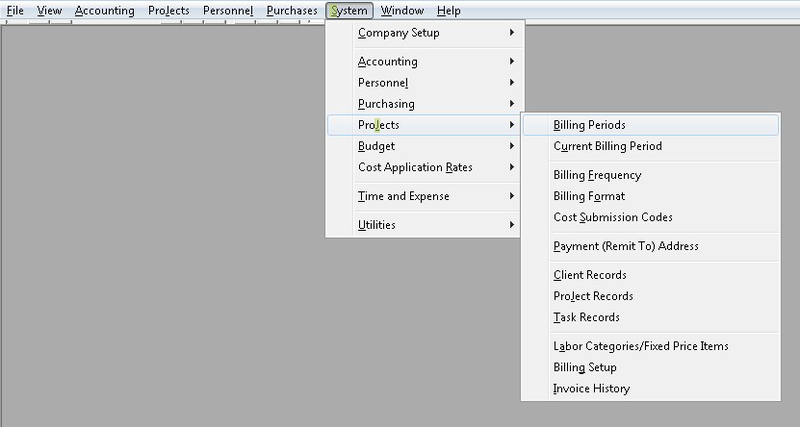 A place that you can use this combination that is not very intuitive is tab one of Billing Setup. 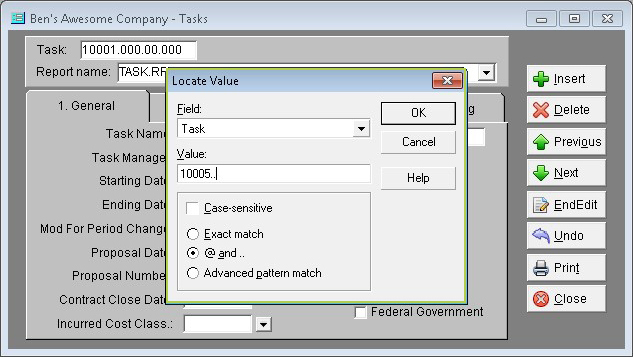 On tab one this will copy the value from the billing setup of the previous task. When you are adding a new option year you can possibly copy the rollup and revenue accounts from the old task depending on how you want to set it up. Just be careful not to copy the revenue task. So, you are adjusting the details of several transactions, and you need to click back in the header of the transaction after each adjustment so that you can navigate to the next one. Next time you want to move between the header and footer of a transaction, just hit “F4”. Once you are back in the header you can search for the next entry to be adjusted with “F5”, or use “Page Up” and “Page Down” to locate it manually. This opens the right-click menu. This might not seem like much, but this means you can hit the down arrow after doing so, and then hit enter to select the “Filter…” option. Filtering is great when you are looking through labor journals for a specific employee or purchase journals for a specific vendor. Just make sure that you DO NOT insert any transactions while you have a field filtered. You just learned how to filter and inserted a transaction while filtered before reading where I said not to, or maybe you have inserted a duplicate personnel record. Regardless of how you got to where you are, if you need to undo something you just created, use this key combination. This seems to be most useful when you have that coworker down the hall that creates personnel records without telling you, so now you are stuck with a duplicate record error on your screen. For one reason or another you need to create a manual labor journal transaction. You just want to type in two lines of detail, but first you need to fill out all those fields in the header. Save yourself the trouble, and use this combination to copy the current transaction you are on. Then you can modify data as needed instead of starting from scratch. Now that you know how to use hotkeys in the system, what better use is there than showing off your skills? Enjoy the convenience as you are now able to save precious seconds while navigating the accounting system. Seriously though, these hotkeys will help you navigate the system much faster and save you a lot of time throughout the day.